Visual imagery and website content may not be reproduced in any form whatsoever. The prestigious Royal Academy of Music, Stockholm, founded in 1771, conserves Roseman's "fine portrait of Birgit Nilsson,'' revered as the greatest Wagnerian soprano of her time. During Roseman's five years at the Metropolitan Opera, he drew the Swedish soprano in her acclaimed role as Brünnhilde in Wagner's Götterdämmerung. The new production of Götterdämmerung in the 1973-74 season completed the Der Ring des Nibelungen cycle for the first presentations of the Ring at the new Metropolitan Opera House, Lincoln Center. A prolific draughtsman, Roseman uses a variety of drawing materials with great versatility. 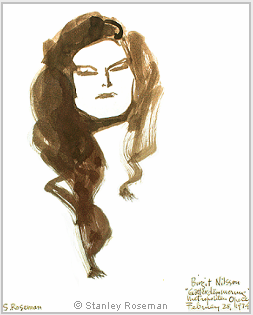 The artist drew the portrait of Birgit Nilsson with brush, bistre ink, and wash. Roseman delineates with the tip of his brush the dramatic soprano's facial features, and with calligraphic brushstrokes the artist renders her flowing, brown hair. Roseman's concentration on physiognomy and the immediacy of expression in the drawing go beyond the theatrical personage on stage to reveal the individual. The portrait Birgit Nilsson, 1974, (fig. 2), was included in the American bicentennial exhibition Stanley Roseman - The Performing Arts in America, comprising the artist's work from opera, theatre, dance, and the circus. The exhibition, produced by Ronald Davis, toured the United States from December 1975 through 1976 and concluded at the Library and Museum for the Performing Arts, Lincoln Center, winter-spring 1977. Shortly thereafter, the Nilsson portrait entered the collection of the Royal Academy of Music. The distinguished musicologist and author Hans Åstrand, Permanent Secretary of the Royal Academy of Music, writes to Davis, who introduced his colleague's work to the Royal Academy: "The Academy wishes to express its gratitude for this valuable addition to its gallery of famous Swedish artists and personalities in the field of music. . . .
"Ronald Davis has presented me with the drawing 'Portrait Ronald' as a gift. I thank you very much and even more, in a heartfelt way, for the great joy you have given us by this. I find that this drawing, too, is a genuine masterpiece and especially impressive to me. With my best wishes, I remain, Your"
Virgil Thomson had admired Roseman's paintings at the Sutton Place apartment of the prominent art collector and attorney L. Arnold Weissberger and his companion, the noted theatre agent Milton Goldman, Vice President of International Creative Management. Suggesting to Thomson that he should have his portrait painted in his advancing years, Weissberger and Goldman recommended Roseman. Thomson graciously consented, knowing that his sitting for a portrait by the young artist would be a reference for Roseman's future career. "Virgil Thomson welcomed me most cordially at his apartment, filled with memorabilia from his long and distinguished career. Before I set up my easel and canvas, we enjoyed a pleasant conversation. We talked of Paris. I mentioned that I had taken graduate courses in art in Rome in summer of 1968 and afterwards, made my first visit to Paris. "Virgil Thomson spoke to me about the piano music of Eric Satie, whom, as he said, he 'revered.' He showed me photographs of himself and other musicians and writers from his Paris years, including Gertrude Stein with whom he collaborated for their famous opera Four Saints in Three Acts. "I also mentioned to the composer that I had studied piano in my youth, which pleased him and deepened the rapport between us. Virgil Thomson thoughtfully asked me where in his apartment I would prefer him to sit and thanked me for suggesting that he might like to read one of his music scores while I painted his portrait." Roseman has beautifully portrayed in oil on canvas the bespectacled, round-faced composer seated in the intimacy of his study, with music score in hand. The artist's brushstrokes are applied with spontaneity and directness in expressing the individuality of the sitter. A harmony of warm and cool tones pervades the painting as sunlight illuminates the composer's forehead and cheeks, flushed with a rosy hue; descends over his short-sleeved, blue shirt and onto the tip of his music score. Virgil Thomson is enveloped in a luminous pictorial space, with blues, pinks, and rose echoed in a sienna background, as if the composer's notes on his music score have become visible in dapples of colored light. Greatly pleased with the portrait and having thanked the artist in letter, Thomson requested that the portrait be exhibited at Carnegie Hall on the occasion of his 80th birthday celebration and the New York premiere of his Symphony No. 3, performed by the American Symphony Orchestra on December 26, 1976, one of the gala events that brought the American bicentennial celebrations to a close. Early in Roseman's career, in 1972, the eminent Pulitzer Prize winning American composer Virgil Thomson sat for the artist at the composer's apartment in the landmark Chelsea Hotel, in New York City. "Virgil Thomson was very pleased with the painting when, several afternoons later, I had finished my work. He thoughtfully presented me with an inscribed gift copy of his autobiography. Sometime thereafter he asked me for a photograph of the portrait for his archives, which were eventually given to Yale University's Gilmore Music Library. I thank you for the photo of it. The Graphische Sammlung Albertina, Vienna, which contains a world-renowned collection of master drawings, conserves a portrait drawing by Roseman of his friend and colleague Ronald Davis, (fig. 3, below). Davis' college studies in art history were brought to the fore in his partnership with Roseman, a partnership that began in the early 1970's. The portrait in the Albertina exemplifies Roseman's virtuosity in the use of the chalk medium for portraiture. The author of this website is proud to include the present work on this page on the artist's portraits. 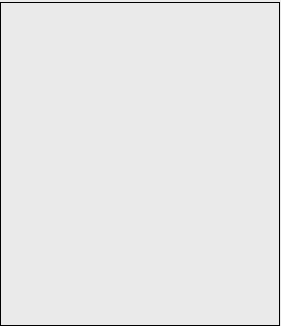 The "Contact'' page provides further information on Davis and his partnership with Roseman. Davis worked closely with Dr. Koschatzky in the preparation of the exhibition Stanley Roseman - Zeichnungen aus Klöstern (Drawings from the Monasteries), 1983. The exhibition was the Albertina's first one-man show of drawings by an American artist. Having acquired eight of the artist's drawings, on the monastic life and on the dance, Dr. Koschatzky requested to make an additional museum purchase of the portrait of Davis. Following the Albertina exhibition, Roseman offered the portrait of his friend as a gift to the museum. "You have delivered to me two drawings by Stanley Roseman, which I have acquired for the Albertina. I thank you and want to express my conviction that the artist is an outstanding draughtsman and painter to whom much recognition and success are due." Roseman's superb oil on canvas portrait Emilia, 1973, (fig. 4a, detail), rendered with fine chiaroscuro modeling, depicts a young Italian-American woman of striking beauty whose luminous complexion is enhanced by her dark hair and brown eyes. 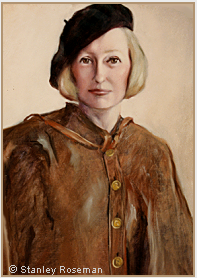 The portrait of Emilia was commissioned by the young woman's mother-in-law Mary C., an ardent collector of the artist's work and a gracious lady of Irish-American descent. Roseman had painted a fine portrait of Mary earlier that year, which elicited from the collector a deeply moving poem dedicated to the artist. The thoughtful collector commissioned the portrait of Emilia as a gift to her son Michael and his wife. 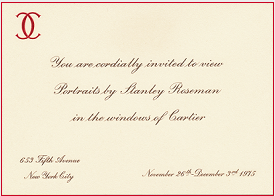 Roseman's portraits attracted the attention of Cartier, the international French jeweler and watch-maker, which requested to present displays with the portraits in the windows of its store on Fifth Avenue in New York City. Cartier exhibited in its two Fifth Avenue windows, in 1975, Roseman's portrait of Emilia, reproduced above and below, (fig. 4b), and an equally excellent, life-size portrait of Ronald Davis, (fig. 5). The portraits complemented each other in the windows of Cartier. Emilia, in a purple blouse and skirt, stands with hands on her hips and glances away in a moment of introspection; Ronald, wearing a white suit in contrast to his summer tan and dark hair and moustache, stands with hands on his waist and looks out at the viewer. The captivating window displays were designed by Raymond Mastrobuoni, Cartier's distinguished Associate Vice President of Visual Merchandising and a leading window designer, who created innovative and marvelous window displays that set high standards for visual merchandising and were noteworthy events for forty years on Fifth Avenue, New York City's world-famous shopping thoroughfare. Cartier presented the Roseman portraits for the festive Thanksgiving holiday with the annual Macy's Thanksgiving Day Parade that brings hundreds of thousands of visitors into Manhattan. in the windows of Cartier"
Writing about his thoughts on art and his working methods, Roseman says: "The presence of the model is a generative force to the creation of my work. That is one of the reasons I do not work from photographs or rely on the camera's translation of form and space onto the two-dimensional surface.'' Roseman's portraits have a vitality and immediacy of expression that comes from painting and drawing directly from life. Rosalie and her husband Theodore, a physician, were avid collectors of the artist's work. A gracious lady and dedicated concert- and theatre-goer, Rosalie was a Francophile, as seen here wearing a stylish beret and pèlerine, or pilgrim's cape. 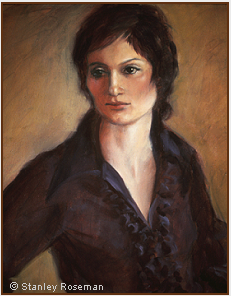 In the oil on canvas portrait Rosalie, 1976, (fig. 6), the artist's painterly textures of materials contrast the black, woolen beret and brown, leather cape with the lady's fair complexion and flaxen hair. Roseman has finely rendered the face of Rosalie, who engages the viewer with a friendly regard. Lively brushstrokes add highlights and shadows on the leather cape, and the black, woolen beret imparts a strong accent to the warm color harmonies of this elegant portrait. 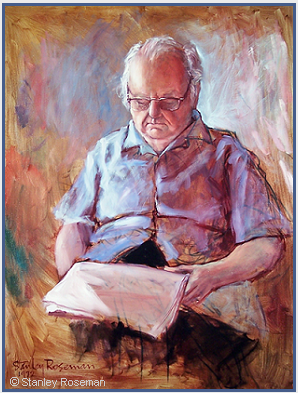 Roseman's portraits include paintings in the medium of oil on canvas and on paper, as with the further selection of the artist's work seen below. Roseman became acquainted with Helena in New York City through mutual friends with whom he and Davis enjoyed convivial dinners. Helena was encouraged by her friends to sit for the artist. Presented here, (fig. 7), is the beautiful portrait Helena, 1974. 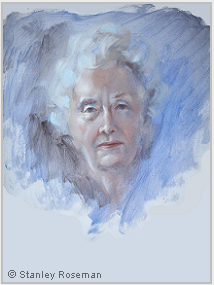 Pastel hues of blue, violet, and pink; subtle, luminous highlights and warm shading of the skin tones; the silvery-white of Helena's hair; and thin glazes of oil paint on Strathmore paper give the portrait its delicate quality. The artist's impression of Helena beautifully conveys the sweetness of this lovely lady entering the later years of her life. The esteem for Roseman's portraits "artistically on a high level,'' to quote again the Swedish daily Aftonbladet, gained Roseman a growing number of portrait commissions. 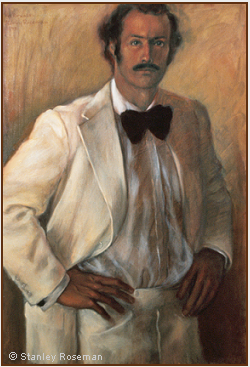 The life-size, oil on canvas portrait Peter, 1977, (fig. 8), was commissioned by the subject who a few years before had begun collecting Roseman's paintings and drawings. The artist painted the portrait of Peter at the art collector's loft in the Soho quarter of Manhattan. With vigorous brushstrokes and dramatic chiaroscuro rendering of the face and figure, Roseman painted the impressive portrait of the husky New Yorker with brown hair and sharply chiseled facial features. As in other portraits by Roseman, the standing figure dominates the composition. 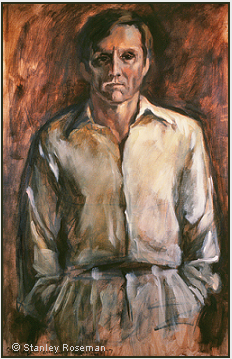 Peter stands with hands in pockets, his white shirt and trousers in strong contrast to the dark earth colors of the background, and looks directly out at the viewer. 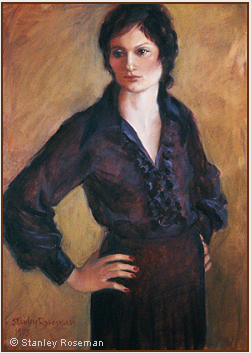 In addition to the standing figures in several of the portraits seen above is the portrait Cynthia, 1973, (fig. 9, below). 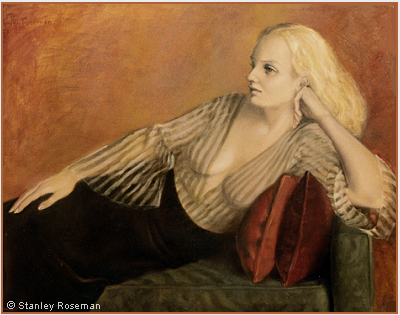 Cynthia, a university graduate in English literature and a devotee of music and the visual arts, commissioned the portrait to accompany her collection of Roseman's work for her New York apartment. With a harmony of rich colors, an effective pyramidal composition, and a masterly technique in the art of portraiture, Roseman created the painting Cynthia. The beautiful woman with long blond hair reclines on velvet pillows of deep orange and maroon on a couch of finely patterned, teal blue fabric. She wears a brown velvet skirt and a décolleté, gray and white striped, chiffon blouse. Cynthia is depicted in repose, her face in profile. Her fair complexion and blond hair are complemented by a background painted in tones of ochre and sienna that further enhance the color harmonies of this superb portrait. The medium of oil paint on paper includes the present work Tom, 1974, (fig. 10). The striking portrait combines lively brushwork and detail rendering in the depiction of the man's strong, facial features, seen in profile, with high forehead and a dark, bushy moustache. Cool highlights on the brow, the bridge and tip of the nose, and cheek and chin contrast with the warm skin tones of the man's summer tan. 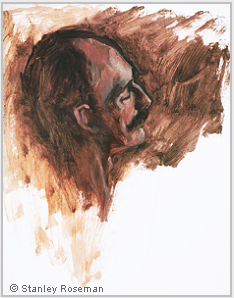 Tom's profile is set against a background of dark browns, sienna, and umber oil paints, which Roseman applied with vigorous brushstrokes. The painterly abstraction of the background with reserved areas of the white paper gives an impression of immediacy to Tom's portrait. 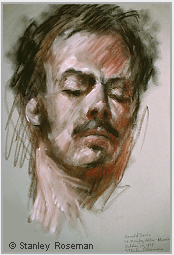 Roseman's portrait commissions during the 1970's when the artist lived in New York City include the oil on canvas portrait Roger, 1973, (fig. 11, below). Roger stood for several painting sessions in the artist's studio in mid-town Manhattan. The composition of the life-size portrait of the good-looking, bearded man brings the subject close to the viewer. 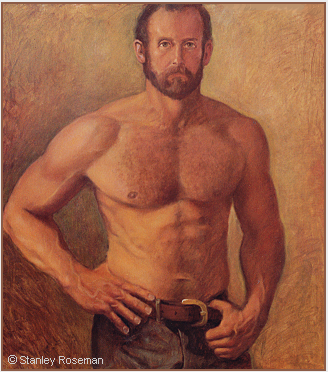 The proximity to the muscular, bare-chested male standing with hands at his waist and looking directly out at the viewer heightens the sensuality of the painting. Roseman's technical virtuosity is here exemplified by the fine rendering of Roger's face and sculptural, chiaroscuro modeling of his impressive physique. With painterly textures the artist describes the man's brown moustache, beard, and body hair, denim trousers, leather belt, and shiny belt buckle. The veins on the man's neck, arms, and hands seem to pulsate with life. Roseman has created a powerful, masculine image in this magnificent painting. On a trip to Los Angeles in 1975, Roseman met a charming, young lady who modeled for the artist and is the subject of the portrait Lisa, (fig. 12). 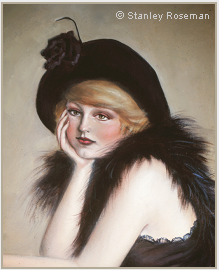 Dressed in black, in striking contrast to her blond hair and peaches-and-cream complexion, Lisa sits with hand to her face, her blue-green eyes gazing out from the canvas. Lisa's lovely face with a blush of rouge on her cheeks and rose-pink lips is dramatically encircled by her black hat and black feather boa. The artist's subtle rendering of blacks gives feathery textures to the boa and a soft sheen to Lisa's black dress with lace trim. Her wide-brimmed hat is adorned with a black rose. The passages of black in the painting and the fair skin tones of the sitter are wonderfully complemented by the pearly gray background. Roseman has eloquently captured with his brush and oil paints an endearing personality in this splendid portrait Lisa. The Bibliothèque Nationale de France in a biographical essay on the artist states that Roseman "combines an innate artistic talent expressed through a wide range of techniques,'' as with his portraits in oil on canvas and on paper, in a variety of drawing materials, in drypoint engraving, and in sculpture. Roseman sculpted in France in 2007 a marvelous portrait of Lino, an amiable, elderly man who lived in a nearby village and whom the artist had befriended. Lino was a mason, having learned the trade from his father. Long retired at the time the artist met Lino, he was an active senior citizen who, in his nineties, still tended his vegetable garden. The sculpture of Lino, seen here, is a living likeness of the model. When Lino sat for the portrait sculpture in Roseman's studio, the artist played CD recordings of the Paris bal musette, the popular, French, accordion dance music which Lino loved and remembered from his youth. The Bibliothèque Nationale de France commends Roseman for his "profound interest in the human condition in portraying different kinds of people, professions, social or artistic groups.'' The Biography pages include selections of Roseman's portraits in museums and private collections from his work on opera and theatre; on the subject of the Clown at the Ringling Bros. and Barnum & Bailey Circus, as well as in the theatre, circus, and music hall in Paris; on the nomadic Saami People of Lappland; and on the Monastic Life. 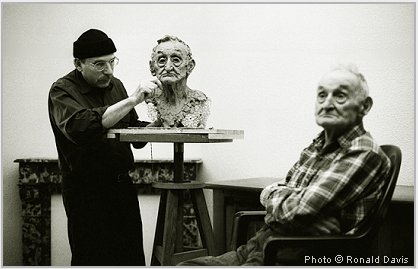 Stanley Roseman sculpting a portrait of Lino, age 93, in 2007. 1. Stanley Roseman, Stanley Roseman and the Dance - Drawings from the Paris Opéra, (Paris: Ronald Davis, 1996), p. 14. 2. Stanley Roseman - Dessins sur la Danse à l'Opéra de Paris (text in French and English), (Paris: Bibliothèque Nationale de France, 1996), p. 11.